Bibi Netanyahu came to Washington and received a cool reception from President Obama. But the Congress embraced him with its usual enthusiasm. Did it matter that Bibi was still issuing “build, baby, build” orders for East Jerusalem? 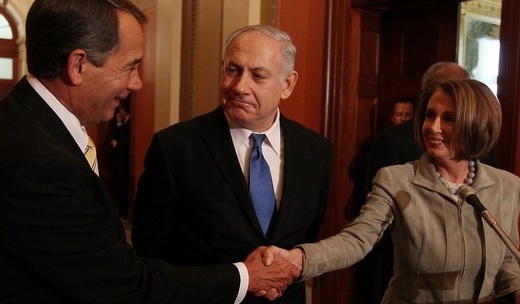 These two leaders of Congress, Rep. John Boehner (R-Ohio) and Speaker Nancy Pelosi (D-Ca) (above) did not think so. When it comes to American foreign policy, these two embrace Israel’s leader, not their own president. None dare call it treason. But what should we call it when these two leaders of Congress defy their own president on a foreign policy matter with direct implications for American military personnel now fighting and dying in Iraq and Afghanistan? This embrace of Bibi was not just embarrassing, it was a slap at the President of the United States. Israel announced 1600 new housing units in East Jerusalem as Vice President Joe Biden was in Israel to further strengthen the bond between “two allies”. Some bonding. To embrace Bibi after his treatment of Biden was nothing less than an act of defiance by leaders of Congress who fawned over the prime minister of Israel just hours before he was ushered into the White House to hold a two hour discussion with President Obama. This visit received none of the usual pomp and photographs that usually are provided for visiting foreign government poo bahs. No pictures, no joint statement, nothing whatsoever, from the White House after Netanyahu and his staff were ushered out of the White House. How eager was Nancy Pelosi to defy her president on this important foreign policy issue? 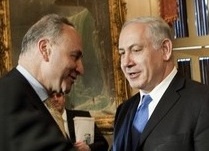 As this moment of warmth shared by Bibi with Senate lion Chuck Schumer (D-NY), indicates, members from both houses of Congress, who consume daily doses of AIPAC kool-aide, were eager for face time with the visiting Israeli leader. All these members of Congress either witnessed, or had read, what Prime Minister Netanyahu said at the AIPAC meeting, a speech which should forever be known as Bibi’s “everyone knows” speech. The administration understands how utterly ridiculous Netanyahu’s statement is. It has never implied that Jerusalem is a settlement. Its position is that the final status of Jerusalem must be decided in negotiations between Israelis and Palestinians, just like every other piece of land added to Israel after the 1967 war. As for Netanyahu’s “everyone knows” formulation, it is bogus. After all, “everyone knows” that Nablus, Hebron, Ramallah and dozens of other West Bank cities will be inside the Palestinian state after negotiations. Can they just annex them now? “Everyone knows”, including Netanyahu and every one of his predecessors since Yitzhak Rabin, that totally Palestinian areas of Jerusalem will almost surely not be part of Israel after negotiations are completed, largely because Israel doesn’t want them and the Palestinians do. The only way Netanyahu can get away with declarations like that at AIPAC is because he knows that his audience knows very little about Jerusalem, including the fact that Israel unilaterally tripled its size after the 1967 war to add entirely Arab areas to the city. One of the reasons it annexed these territories was so that it could give them up in the context of negotiations and say, “hey, we even gave up parts of Jerusalem.” But Netanyahu is saying that even these Arab neighborhoods are off the table. Another Foreign Policy analysis of the speech is entitled, Jerusalem Settlements and the Everybody Knows Fallacy. It includes valuable history, illustrating the long range Israeli plan to colonize Jerusalem. In 1993, when the peace process was taking off, the settlement of Ramat Shlomo — which last week caused such a headache for Vice President Biden — didn’t exist. The site was an empty hill in East Jerusalem (not “no man’s land,” as some have asserted), home only to dirt, trees and grazing goats. It was empty because Israel expropriated the land in 1973 from the Palestinian village of Shuafat and made it off-limits to development. Only later, with the onset of the peace process era, was the land zoned for construction and a brand-new settlement called Rehkes Shuafat (later renamed Ramat Shlomo) built. If in 1993 you had asked what areas “everybody knows” would stay part of Israel under any future agreement, the area that is today Ramat Shlomo — territorially distinct from any other settlement and contiguous with the Palestinian neighborhood of Shuafat — would not have been mentioned. Minutes before Mr Netanyahu’s fence-mending visit to the White House on Tuesday, the Jerusalem municipal government announced that it had approved another development. These new units will be on the grounds of the Shepherds’ Hotel. That project, like the 1600 unit project which led to the Biden insult, has long been working its way through the pipeline. Israeli planning commissions think long range. The Shepherd Hotel in the Sheikh Jarrah neighborhood was initially purchased by American Jewish tycoon Irving Moskowitz in 1985 for $1 million. Moskowitz is a long time and influential supporter of Israeli settlement in East Jerusalem. He had planned to tear down the hotel and build housing units for Jewish Israelis in its place. The Jerusalem planning council issued its final approval for the project during Bibi’s trip. The approval now enables the settlers to begin their construction at once, though not exactly as Moskowitz had planned. One existing structure in the area will be torn down to make room for 20 new housing units, while the historic Shepherd Hotel will remain intact. A three-story parking structure and an access road will also be constructed on site. Moskowitz’s 1985 purchase has finally produced what he wanted, more Jewish settlers in Arab East Jerusalem. History is always important in understanding Jerusalem. The reference above to Presidents Johnson and Reagan referred only to the general perception of them as forceful, even uncompromising, presidents. I was not referring to their stances on the Middle East where Reagan, only once or twice, stood up to the lobby and LBJ never did. On matters relating to the Middle East, the toughest president by far – and the one who saved tens of thousands of Israeli and Egyptian lives by his forceful leadership that produced the Israeli-Egyptian peace treaty – was President Jimmy Carter. Carter was indeed the best US presidential friend the Israeli people ever had. Too bad they failed to realize it. Now is the time for President Obama to show some of that same Carter tough love and save the people of Israel from a right wing Prime Minister who is on a disaster course to become a modern day Samson, determined to pull down the walls of yet another Philistine temple. Step one for Obama was the cool reception he gave Bibi in the White House. Whatever follows this latest Bibi-Barack encounter, this much is certain: Obama has said to Bibi, the Congress and AIPAC, I run US foreign policy, you don’t. The pictures above of Republican leaders Boehner and Speaker Pelosi and of Democratic Senator Schumer are from the web site www.freerepublic.com. It is indeed encouraging to see the President make it clear that Bibi and he are not on the same page and that “everyone knows” does not include him. I have wondered if the power Barack was willing to employ in getting the health care bill passed has strengthened his resolve to use it elsewhere. If so, more power to him. It is similarly disappointing that our most prominent legislators let themselves be counted in Bibi’s “everyone knows”. The Congressional fawning obviously overlooks the real situation in that land. It also strongly suggests that, not the NRA, but AIPAC is the strongest lobby in the US. It also means that the Palestinians do not have a hope in hell, and perhaps where they are, aided and abetted by we, the USA. I wonder where Petraeus’ statement comes into play here… and if the president is more concerned about the ideas of the US military or AIPAC. Rather baffling to cite Carter for accepting Egypt’s blackmail offer to sell out the Palestinians. It costs us over 2 billion a year. Try getting the deal without the money. Egpyt’s treatment of Palestinians is criminal. Thanks for your work for justice! SOMBFAJ (Some of my best friends are Jews), but I am very frustrated by the attitude of the Israeli government toward the Palestinians. In that frustration, I know I am joined by a great many Jews here in the United States, and even in Israel itself. President Obama appears to want to aggressively address this problem, and I expect his staff has already been doing a lot of homework. The sick thing is that Isreal itself would be much better off if it were to act in a more neighborly ways toward the Palestinians. The fact that there are indeed many irrational Palestinian extremists is not a proper excuse for Israel’s seemingly implacable hostility towards Palestine. I commend Obama (even though, with that name, he may well be Irish), and wish him luck. Jim. Thanks again for your latest report on the Israel- Palistine situation. It is appreciated. Let’s hope that the President can hold firm. Harris Fawell, Member of Congress, retired.